The Islamic Center cooperates with U.S. Administration, Muslim and non-Muslim Organizations to promote a better understanding of Islam and the Islamic Center’s ideals. In November 1944, the idea for building a Mosque in Washington DC was born through a discussion between Mr. M. Abu Al Hawa and the former Ambassador of Egypt, Mr. Mahmood Hassan Pasha. Soon thereafter, a handful of diplomats and American Muslims formed the Washington Mosque Foundation. The Foundation’s membership quickly grew to include representatives from every Islamic nation in the world and American citizens. They all supported the Foundation’s appeal for funds. They managed to raise enough money that enabled them to purchase the land that the Center sits on now on Washington’s “Embassy Row”. They purchased the land on April 30, 1946, and laid the cornerstone on January 11, 1949. Talk about letting the enemy setup shop in our own backyard. It sounds like we have our very own Organization of the Islamic Conference, going on right in Washington. Also note their precise planning, on their chosen location to spread the the Islam means peace falsehood. They are not stupid. It is very telling how they join hands, when it comes to spreading Islam. Does anyone here think that Egypt or Turkey, are going to stand with us over Islam? Are these actions part of that so called “rich culture”? Or how about this one Mr. President? Is this what President Eisenhower respected? 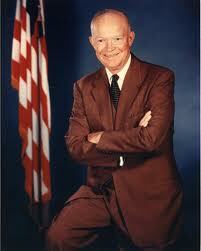 Lets see what else Eisenhower had to say. Speak for yourself Mr. President. Why would you fight for something that is out to destroy America? Because you were obviously uniformed on Islam, and you clearly showed that when you called a Mosque a Church. Slight difference there. For the record, now we see just how far back Washington has been bowing to Islam. We have a lot of work to do! Unfortunately Eisenhower was not done bowing yet. Their goal is destroy America, was that yours? Did you know that there is no equal justice for non-Muslims under Sharia Law? Of course not. Now we move on and see how leaders from Islamic countries from across the world, are influencing Washington. H. E. Roble Olhaye, Ambassador of the Republic of Djibouty- Dean Of The Diplomatic Corps In USA- Chairman Of The Board Of Directors Of The Islamic Center. The Center is administered by a board of directors that comprises of all the ambassadors from Islamic Countries accredited to the United States of America. The current chairman of the Board is His Exellency Roble Olhaye, Ambassador of the Republic of Djibouty to The United States. The daily affairs of the Center are run by the executive director and his staff. Shaha’da: More than 14,000 people have declared the Shaha’da and accepted the Islamic faith since the opening of the Center in 1957. Speaking of Islamic Law, and the Ahadith. Do you guys like this verse? Back to their infiltration of America. Da’wah at the Center: Large groups of visitors from all around the United States come to the Center on a daily basis . The Center is registered as a historic building in the Nation’s Capital. Printing: The Center prints different types of brochures and booklets. A total of 50,000 brochures (seven different kinds) are printed and distributed every year to new Muslims, visitors of the Center and those asking for information on Islam. Multimedia: The Center sends cassettes and video tapes to teach Salat (prayer), Qu’ran and the principles of Islam to individuals, institutions and those who want to know about Islam. Special Programs For The State Department: The Center provides special programs for the State Department Diplomats of the United States before they go to Islamic countries. Lectures And Seminars: The Center receives many requests from universities, institutions, churches, schools, organizations and communities for lectures and we respond to their requests. Like I said, they are not stupid. The Islamic Center knows exactly who to target. Now it is our job to counter them in the information war. By the way, they are still not done putting the State Department under their bootheel. Individual visitors are welcome to the Center every day during hours outside of praying times. Group visits and/or Lecture require for the respective group leaders to fill and submit the Group visit form. visits may be arranged for monday to friday, 10:30 am to 4:30 pm. The coordinator for group visits and lecture is Brother Abbassie Koroma. Visitors from the State Department need to contact Sister Fatimah Goodwin (fatimah@theislamiccenter.com) or Dr Abdullah Khouj. Here is a little more information from Dr Abdullah Khouj, that was on a State Deptartment website. Abdullah M. Khouj, imam of the Islamic Center of Washington since 1984, said that since he arrived, the number of participants at prayers, held five times a day, has gone from hundreds to thousands — he estimates that 3,000 participate at Friday prayers. Khouj said they come from roughly 75 countries — they are visitors, diplomats, students and American Muslims, both immigrant and native-born. From the Islamic Center’s services page. More than 14,000 Muslims have been married at the Islamic Center since 1957. For information about how to perform Islamic Marriage click here. Through an endowment by King Faisal and King Fahd, the Islamic Center has offered free gravesites to thousands of Muslims. Annual Bazzar (International Mother’s Day Bazaar) takes place at the Center every year on the second saturday of the month of May. I am not sure which Islamic center is doing more damage to America. The Islamic Center of Greater Houston, or this one? We’ll close this one out by looking at their worship page. 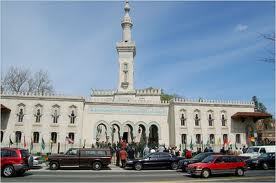 The Islamic Center of Washington D.C. Welcomes All To Come & Worship. The Islamic Center traces its origins to a need, more than fifty years ago. It was created to become a place where muslims in the Washington DC metropolitan area could perform basic religious duties and prayer. It was at the funeral of an eminent muslim that the void was felt most accutely. Muslim dignitaries present at the event set out to build a mosque. That basic cornerstone – the mosque – would through various stages of its development, evolve into what is now known as the Islamic Center. In spite of the many years that have passed, the basic mission has always been to serve as a place of worship for muslims – which is still deeply rooted to the core of the Center. In line with that mandate, the mosque is open to all. All are welcome to come and worship day and night, during the regular times of the mandatory prayers. The mosque opens 30 min. before the call to Fajr (dawn) prayer and is open until one hour after the Isha (final) prayer. Then all access to the Islamic Center is restricted until it reopens its doors for the regular business activities at 10am. The Islamic Center prohibits people to stay in the mosque after closing time. The mosque is a place of worship and sleeping there is strictly forbidden. For more information about the prayer times, please visit our page on Prayer Times. Does anyone reading know if they are actually broadcasting the call to prayer, into the streets? 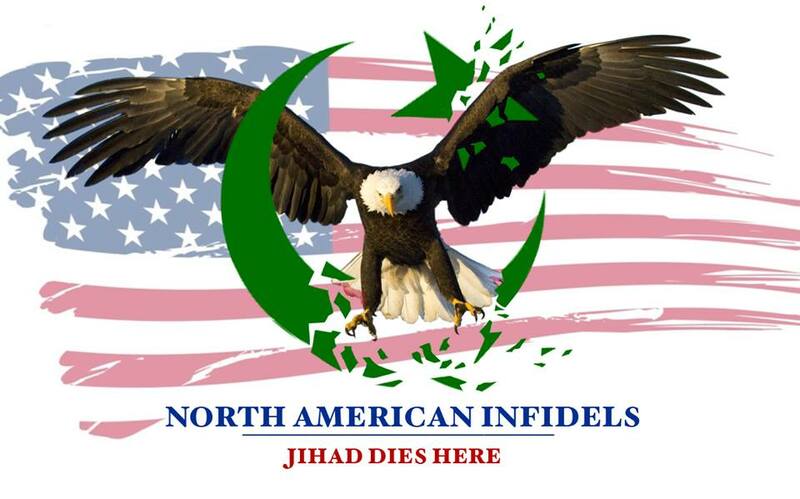 As for the Islamic Center, they have certainly done their part in turning our government against us in this war. We are behind the eight ball, and have to make up for lost time. It’s now or never! ← Do you Want to Preserve our Freedoms? Ike seemed to be a little clueless. YOU ARE THE ONE WHO IS CLUELESS! Muslims want Sharia Law, that was not a common goal with Eishenhower. On this issue he was uninformed. Now the only reason I see why she would write such a book is because she can. If only 14000 has converted in over 50 years, then it’s not so bad after all. I read just the other day that UK have 100000 converts! That’s really bad!! Probably over-exaggurated, the arselifters always trying to be over the top. To absorb the full impact of this information (along with the other nauseatingly Wilsonian statements of Eisenhower’s quoted in the article), one must remember that Eisenhower is vaunted as one of the great — and one of the staunchest — conservatives in 20th century America (also note that his Vice-President was Richard Nixon). He was staunchly anti-Communist, for example. Furthermore, before he was elected President (to two terms), he was one of the great Generals of World War 2. Lastly, Eisenhower flourished in the heydays of the 1950s — surely, one would think, a decade unencumbered by the disease of political correctness. And yet, here we have straight from Eisenhower nauseatingly PC MC sentiments about Islam and about Muslims. They could just as well have been spoken by that other benighted neo-Wilsonian, George Bush — or by Obama. This is one indication among many I have noticed over the years that PC MC did not spring out of nowhere, nor did it not pop out of the blue sky: it has roots going back to the early 20th century, beyond that to the 19th, then the 18th (where its first burst into relative prevalence may be located in the so-called “Enlightenment”). I even found PC MC as far back as the 16th century, in the famous essayist and politician Montaigne (see my essay, Montaigne: Godfather of PC MC?). The only difference that seems to remain is that, while there was PC MC here and there prior to the latter half of the 20th century (and even, as we have seen, smack dab in the supposedly “conservative” 50s), PC MC only attained mainstream dominance throughout the West beginning in the 1960s. And, apart from the blip of the Reagan/Thatcher/Pope John Paul II Era of the 80s, it has been getting stronger and stronger with each passing decade. Paradoxically and perversely, PC MC has been strengthened, not weakened, with regard to its idiotic protection of Muslims after 911: the more that Muslims explode, the more that the PC MC West anxiously seeks to protect Muslims. I also added you to the blogroll here. Great, thanks Chris, and I will check my email (I have more than one account, and don’t check it every day). Where you been buddy? Have not seen you @ JWU in a long time. Whats up with that? Did you get bannished? Its all right man, I get banished from there all the time. Glad to see that you are still in the fight! That right you have a blog also, dont you? Im going to check you out right now. The issue here is that Hesperado was banned multiple times for simply getting under the skin of the moderators (and that is truly the real reason), while somebody who has threatened other members with violence has been given a pass on more than one occasion. — that “somebody” to which he refers being the long-time JW reader “awake”, who numerous times on JW (and on my own blog) insulted me, demonstrated irrational and uncontrolled anger against me, and at least once wrote a veiled threat against me. These articles call them “Hanafi” Muslims, as though that is some kind of sectarian splinter: but Hanafi Muslims are just regular Sunni Muslims who follow the one madhab of Islamic law called Hanafi. Blasphemy! Next thing you know, we’ll be told that St.George of Bush said the Shahādah at the same holy place!